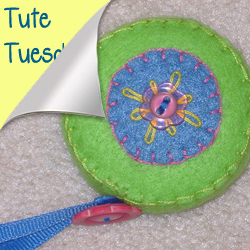 This week on Tute Tuesday we have a lovely little covered tape measure/tape measure cozy shared with us by graced It’s a great way to give your sewing supplies and extra dose of pretty, or a little gift for a friend or loved one who loves to sew. It’s adaptable to virtually endless styles and designs! Thanks for sharing this adorable little project, graced!